Key West, Florida is chock full of exciting island adventures. Join us on the one of a kind Island Ting adventure out to the beautiful Key West coral reef aboard our luxurious sailing catamaran. Our Island Ting excursion is like no other. This is a full day adventure that features sailing, snorkeling, kayaking and much more. After climbing aboard our 40-person sailing catamaran, you will feel the warm morning breeze as you sail out to sea. Munch on scrumptious complimentary light breakfast foods featuring fresh fruit, pastries, quiche and juices as you breathe in the salty sea air of the Gulf of Mexico. Before you know it, the Island Ting will reach the coral reef system of the Florida Keys. This is the largest living coral reef ecosystem in the continental United States. There is no other place in the country where one can experience snorkeling like this. You will be provided with complimentary sanitized snorkeling equipment and then given the opportunity to swim some 10-12 feet on the clear blue waters of the reef system. 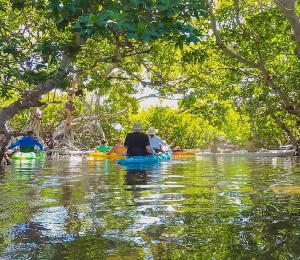 This amazing snorkeling experience is followed by the opportunity to kayak in the primitive mangrove islands located in the Key West back country. Keep your eyes peeled for a wide assortment of wildlife that make their home in this nature refuge. The Island Ting provides its guests with a full delicious buffet lunch made up of shrimp, fried chicken, meats, cheeses, bread for sandwich making, salads, desert, juices, and soft drinks. For the drinkers on board, you will also be treated to complimentary beer, wine, and our signature homemade sangria.